The tiles that line the walls of Lisbon tell the tale of the city and of Portugal. These tiles were once perfectly ordered and neat. Each predictably after the other. They once were certain and stood confidently facing the sun and the sea. But time has designs of its own. It has sought to destroy some and gently wear away at others. Some tiles that were lost could not be replaced. In such places, rather than remove all the tiles and start again, the owners of the buildings simply replaced them with other tiles. This has created a complex patchwork, all the more beautiful for the story it tells. And although the buildings' owners do the best they can, perhaps time is the real architect. 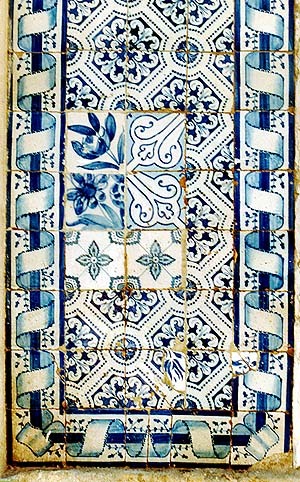 Portuguese tiles, known as azulejos, adorn the inside and outside of almost every home in Portugal. Although introduced to Iberia by Moors, the fashion continued after they left. The Moors restricted themselves arabesque geometric patterns of triangles, squares, and diamonds, probably because many of them belonged to the Sunni brach of Islam which prohibited images of living things. Portuguese and Flemish artists began to produce tiles in Lisbon in the 16th Century. Blue and yellow were the favorite color combination and tiles depicted mostly floral patterns or religious scenes. The ever expanding Portuguese empire provided increasingly more exotic themes and colors. Towards the end of the 17th Century the fashion changed and blue tiles became popular. This was probably to to the craze for blue and white porcelain from China, that was being imported into Europe at this time. This association with blue tiles tempts many to think that the word azulejo comes from the Portuguese word for blue (azul), but it is in fact much older and has its origins in Arabic. After the earthquake of 1755 there was a return to multi-colored tiles. It was about this time too that the Portuguese in Brazil discovered that tiles were ideal for keeping out the damp. In the rebuilt Lisbon houses were encased in tiles, and this tradition continues today. The taste for blue and white never abated and some spectacular examples can be seen in Porto's São Bento railway station. But the medium has not stood still. Like Portugal, tiles modernized and developed. They were incorporated into commercial buildings and even used for advertising. The patronage of businesses and organizations such as the Lisboa Metropolitano subway, has encouraged the art form to regenerate itself and become, not just part of Portugal's heritge, but part of the fabric of modern Portugal too. The taste for blue and white never abated and some spectacuar examples can be seen in Porto's São Bento railway station. But the medium has not stood still. Like Portugal, tiles modernized and developed. They were incorporated into commercial buildings and even used for adertising. The patronage of businesses and organizations such as the Lisboa Metropolitano subway, has encouraged the art form to regenerate itself and become, not just part of Portugal's heritage, but part of the fabric of modern Portugal too. These are just some of the tiles that you can see on this site. All were photographed in the streets of Lisbon. You can see more of any tile by clicking on it. You can return to the main page by clicking on the Azulejos de Lisboa tile pictured below. Alternative you can see all of the tiles on the index page.